If director Marvin Suarez set out to make a comedy with his 26 minute film Zombie Chronicles: The Infected, then bravo, but the sad reality is that he actually set out to make a genuine horror film. 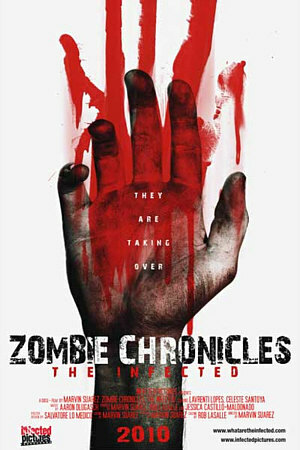 Referred to as the most anticipated zombie film of 2010 (anticipated by who, nobody knows), Zombie Chronicles: The Infected is the kind of film that stays with you, but probably not in the way the filmmaker, Mr. Suarez intended. It’s New York City and the Zombie apocalypse has arrived. A team of Paramedics “Sarah and Josh” are trying to save lives in the middle of the zombie pandemic. That is a synopsis for the film, from the summary provided by Mr. Suarez on the film’s IMDB page. The films’ story of a zombie rampage on the city of Manhattan is hardly original, but like Tommy Wiseau’s The Room and James Nguyen’s Birdemic: Shock and Terror, Mr. Suarez’s film is one that you have to see to believe. Don’t worry, The Room and Birdemic: Shock and Terror shall always reign supreme as the ”best of gloriously bad”, but on a smaller scale, Mr. Suarez’s film is certainly worthy of mention. Now, it’s easy to toss aside these films as simply awful and wonder if they’ve been made fun of on RiffTrax yet, but to me, it goes deeper than that. To me, these are the kinds of films that are bad, so very, very bad, but they’re so bad that you just have to see them and I consider Mr. Suarez’s film to fit into that ”bad, but hard to resist” category thanks to the films’ shoddy camera work and the fact that there is no lighting, as in there is no light in his scenes. I’m not kidding, a large portion of the film is in complete darkness. But the reason this film earns a spot on the ”bad, but hard to resist” list is perhaps the most unintentionally comic performance of all time from actor Lavrenti Lopes as one of the films’ heroes ”Josh the Paramedic”. Filmmakers, take this advice from late, great director John Huston seriously ”90 percent of directing is casting”. Mr. Suarez probably should have followed that rule, and if you’re an overly critical film viewer or filmmaker yourself, you may take fault with Mr. Suarez’s choice of Mr. Lopes as his films’ hero. But you know what, I’m glad he didn’t follow that rule, because if he had gone with, say a good actor, we would not be treated to the visual feast that is the performance of Lavrenti Lopes, who stars in the pivotal role of Josh in Zombie Chronicles: The Infected. I didn’t think it was possible to see a performance in a motion picture as gloriously awful as Tommy Wiseau’s in The Room and then I saw Alan Bagh’s hysterical performance in Birdemic: Shock and Terror. Now, I must admit, I am quite stunned, because I didn’t think it possible for anyone to top Mr. Bagh’s. There are currently 1 Comment on Short Film Review: Zombie Chronicles: The Infected. Perhaps you would like to add one of your own?